Attend a presentation highlighting the benefits and challenges of exhibiting multiple species in one exhibit. Daily Presentations run Memorial Day thru Labor Day. 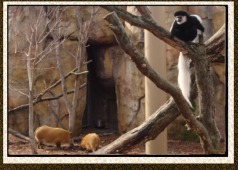 Presentations will be held in front of the Red river hog / Colobus monkey exhibit located in Africa!